After receiving a disc and a one-month free trial period of the revamped successor to Final Fantasy XIV, subtitled A Realm Reborn, and which we will now call ARR, in order to save everybody time, the first thing I do is update. There’s the PS3 firmware update, some 800 megabits. Then there are many gigabits of patches for ARR itself, all live since the game’s release in August. I can see the file names and it feels like I’m watching Final Fantasy XIV get dressed. It’s curious, I think, because A Realm Reborn is practically Windows 7 to Final Fantasy XIV’s Vista, the on-disc service pack atoning for the sins of its past incarnation. The literature reminds me that, in fact, the truth is much more exciting and technical. On November 11, 2012, a celestial body, hurtling towards Final Fantasy XIV’s world of Eorzea with cataclysmic fury, burst into a dragon with the power to turn off all of the Final Fantasy XIV servers. A meteor and a monster turned the world off. Ten months later, the servers returned bearing a new Eorzea. Entirely rebuilt from The Calamity, the do-over version of Final Fantasy XIV, aptly named A Realm Reborn, promises an entirely new experience built on the skeleton of its predecessor. Out went the old graphics engine, and in came the Full Active Time Event (FATE) system. Gone were the eight zones of the old world, replaced by forty new, rubble-free zones, still centered on the same three city-states. And by some stroke of real calamity, the Lalafell, a horrible race of child-people, were sadly not extinguished when this realm was reborn from the ashes. It’s in this refreshed state that I finish downloading and installing every patch Square-Enix can throw at me (there will be four more during my month with the game), and create my Square-Enix service account. Almost there. I check the confirmation email, input my one-time password, and an actual game menu appears, complete with options like New Game and Options. Finally, the setup is over and I can join Eorzea in play. 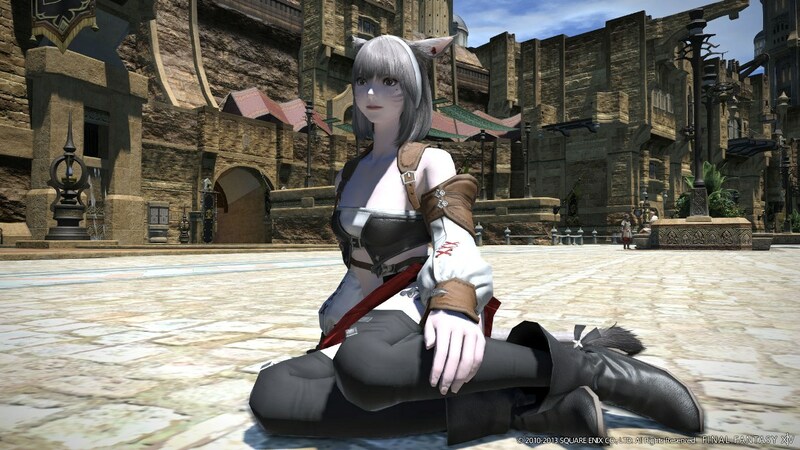 I choose a female Miqo’te, a slender woman with cat ears and a tail, and name her Susan Beeanthony. I’m sure the famous suffragette of her namesake would be proud to know her legacy is being so faithfully preserved on the Moogle server in Final Fantasy XIV: A Realm Reborn. Naturally, she’s a Seeker of the Sun. I blow through the character creation specs, stopping only long enough to tat up one half of Susan’s face in solid purple. The deciding moment in character creation falls to class selection. I choose to Conjure, because conjuration in The Elder Scrolls V: Skyrim means letting others fight for you, and my highest ranking life skill is delegation. It does not mean the same thing in ARR. Choosing the occupation of Conjurer drops me into a covered wagon on my way to the forest city-state of Gridania. Two moogles bop around behind me, and a friendly trader explains the server-dragon situation succinctly. I arrive at the adventurer’s guild in Gridania and am given control. Instantly, I remember that I’m playing a PC game with a PS3 controller on a PS3. Twin stick movement is about all that comes intuitively—for everything else, there are pages of tutorials and a long, consistently confounding learning curve. I try to talk to a nearby Elezen (elf), and buy a shirt by mistake. I try to open the mini-map and use the Doubt expression instead. I give up trying to figure it all out at once, satisfied after a time to just move and talk intentionally. My legs under me, Gridania opens up, artistically and conceptually. Hearkening to Lothlorien—or more recently Eruyt Village from Final Fantasy XII—the two walks of Gridania (Old and New) entwine with the surrounding forest, dominated by mammoth tree trunks and autumn foliage. The architecture of the wooden huts has a rigid curvature about it like a cursive love letter to high fantasy. Sunlight dots the ground between leafy shadows, Elezen vendors and scurrying players. Most of the players are costumed as ghosts. Eventually, I stumble into Mother Miounne, the gatekeeper of the “main quest”. She’s a tall, broad Elezen woman behind a desk at the adventurer’s guild. There are other players surrounding her, apparently just staring lifelessly back and forth. The rest of the guild hall hums with players involved in crafting activities. A fiery exclamation point floats above Mother Miounne’s head—I can see it from the door to the guild. This must be important. “Scarcely a square malm in the Twelveswood was spared the devastation,” she says, grinning. Wait, is she talking to me? “I am well aware of how improbable that must sound to an outsider,” she continues. “It is improbable. But it’s also true.” Well, at least we’re on the same page. “Susan Beeanthony, hm? And you’re quite sure that isn’t an amusing alias?” Now she’s just being coy. I get the assignment and leave her to her musings. Outside, I notice a nearby wooden shack. I enter, and inquire at the desk. Yes, of course I want to be a carpenter. I am not allowed until Level 10. I find another wooden shack, this one with a broad, open reception area. Yes, of course I want to start my own free company, like the guilds of other MMOs. I am not allowed until Level 25. I discover a broker who offers to pair me with a minion. Yes, of course I want to own a slave creature. I am not allowed until I learn the slave whistle. Failing all that, my first quest finds me at the Conjurer’s Guild. It’s secluded, down in a cave beyond a fountain plaza. The conjurers appear to be gathered on a platform suspended above a cave pit. I learn from the silver-haired child leader that conjuring is not, as I’d hoped, a discipline of summoning. Apparently, that’s Summoning. Conjurers, on the other hand, commune with nature to develop strong healing and preservation spells. To begin the walk in transcendent harmony with nature, I must first destroy nature. I’m asked to murder several squirrels, ladybugs and fungi, using rocks to stone them all to death. The experience from the genocide bumps me to the next level, and I learn Cure. On the way back to the Conjurer’s Guild cave, I notice that the city is littered with errant jack-o-lanterns that light up during the evening cycle, dotting the now blue palette with bursts of orange and yellow. Passing an amphitheater, I talk to a pumpkin-headed proprietor, Impresario, who outfits me with a white sheet with eye holes, apparently in commemoration of All Saints’ Wake. I don the sheet, and then kill more ladybugs. Looking like a ghost (or perhaps worse) doesn’t keep townsfolk from handing me their letters to courier or from asking me to eliminate more creatures outside the town. I acquiesce to both. One quest objective reads: “Paulemont, a guard at E-Tatt’s Spire, seeks a diligent adventurer to scrub clean a pair of begrimed road signs.” I speak with Paulemont, who instructs me to a clean a pair of begrimed road signs. I run up to the signs, kneel down to let a bar fill up from left to right, do it again, then return to Paulemont. He’s sitting on an old stump near a deserted campfire minding a cooking pot. I turn off the profanity filter. Not long after reaching Level 10, Susan starts to stutter. Something is wrong, but it’s not what I had suspected. 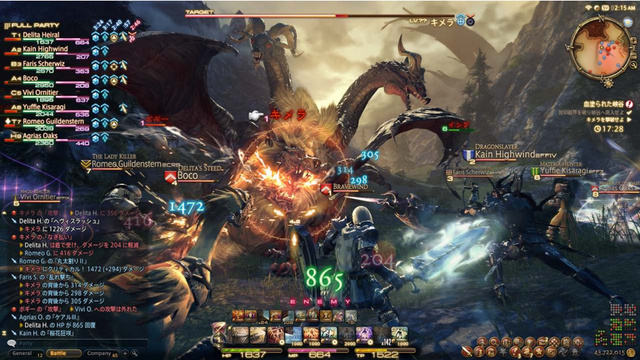 The connection to the server is spotty, evidenced by latency in battle, longer load times and the occasional need for a hard reset. I hop on my computer and run some ping tests from my home router, then reboot everything and try again. The stutter persists. Only after I’ve set up a second router do I have the revelation that the Moogle server (where Susan resides) is a European server. Along with this discovery comes three terrifying thoughts. First, Susan Beeanthony is not American. Second, nobody was laughing at my clever naming work (and now that I think about it, the few transmissions I had seen were all in French). Third, I would need to start a new character on a domestic server. In honor of the spirit of America, I recruit a white-haired male orc (Roegadyn) on the Marlboro server and name him Calme Ishmael. He hails from the Sea Wolves clan in the oceanside city of Limsa Lominsa where he wields his axe for his guardian god, Menphina. He has tattoos covering half of his face, too. I arrive at the city-state on a galleon instead of a carriage and soon find myself in another adventurer’s guild collecting and completing errands for the townsfolk. There are more Roegadyn loitering around the white stone promenades and pirate halls of Limsa Lominsa than the wooden decks of Gridania, the sections connected vertically with stairs and an elevator. Each stone building juts from the ocean below, covered in hanging ropes and lanterns and littered with errant barrels and cargo. Suspended walkways complete the medieval Treasure Island mystique. For the first time, I notice the music. It’s a plucky, percussive jig pregnant with the promise of grand adventure, like leaning over the bow of a pirate galleon. Gridania’s lilting, symphonic calm lies far behind. Limsa Lominsa’s guilds host more players, fewer of them crafting and more in-transit. A goblin perches on the edge of a walkway, snickering. Limsa Lominsa’s emblematic castle houses the adventurer’s guild, where I put the axe to work. The first few hours of quests chart a similar course. I dispatch wharf rats, ladybugs and lost lambs (I’m a monster, by the way), and return for the spoils. Leveling up happens much quicker with Calme than with Susan, partly because battles move quicker with an attack-heavy tank and partly because I’ve crested the initial learning curve. Targeting in a field with multiple enemies is still arbitrary at best, but the other pieces have fallen into place. Back in Limsa Lominsa, I’m approached by another player. His or her Miqo’te is named Fried Chickeen. I send it a friend request. Hours later, I receive an invite to join a free company called Fatality. I join, and find that a few thousand others have also signed up for Fatality, now all sharing the same moniker at the end of their player name to show clan pride. I look at my own name, now: Calme Ishmael [WTF]. I expatriate myself from Fatality. A quest objective finds me picking up “peculiar herbs” from the ground to deliver to a Roegadyn in the town square. His name is Ahldskyf, and he explains that the herbs are Althyk lavender. I go visit Frydwyb down in East Hawkers’ Alley, then P’tahjha at Mealvaan’s Gate. Here are some other names I encounter in Limsa Lominsa that are fun to say out loud: S’dhodjbi, O’kalkaya, Abylfarr, N’tanmo, Mucose Mummer, Sisipu, Merlwyb, Zanthael, Wyrnzoen, N’delika, H’lahono, H’naanza, Ahtbyrm and who could forget X’payan. In the corner of one gathering house, I meet a man called Neddard. He says that The Calamity killed his wife, his son and his daughter-in-law all at once. It sounds like a red wedding to me. As I level up, I jump into more FATEs, which occur randomly and usually draw a crowd of other players. Really, it’s the same thing I do without them, but different music plays, sometimes it syncs my level down, and the payout is greater. Every so often, a FATE will star a plus-sized enemy model with loads of health. There’s always more than enough to go around. One FATE pits me mano a mano with a larger version of the river toad. It’s more daunting, and more time-consuming, than it sounds. Eleven minutes later and it still has half of its health, and the FATE ends. I take out a murder of jellyfish (assuming jellyfish travel in murders) and level up, learning a new axe technique. It’s another way to axe enemies. I do. I decide to check back in with Susan. I finally complete the Level 10 Conjurer’s Guild quest with Susan the cat woman and join every other available guild. The first I try is Botany, which is predictably lame. Leather-making isn’t much better. Archery rises above tedium, but does require buying all new armor sets and brings me back to slaying ladybugs at Level 1. The persistence of ARR becomes clearer, if more disappointing. I progress far enough in the story to hear a few lines of spoken, voice-acted dialogue, which reminds me that the localized text of a Japanese fantasy game will always sound localized. But seconds later, when the dialogue fades out, the silence gets lonely, and I miss the broken English. After defeating a gargoyle and a masked sorcerer, I’m heaved through a lengthy cut scene of floating crystals, the Garlean Empire’s stormtrooper camp and a parade. Following another conversation, airship travel opens, allowing access to the two other city-states, Limsa Lominsa and Ul’Dah, and the job classes with guilds therein. It also opens up access to all the lower level quests from these regions, now ripe for training a secondary class. Susan doesn’t roll like that. How Susan does roll, however, creates some issues for other players. Instanced dungeons are harder, separated duties reserved for teams of players with complementary skillsets that are necessary to fight through hordes of increasingly difficult enemies to a boss battle at the end, collecting loot along the way. Teamwork and role-playing are critical here. Susan is a lone(ly) wolf. Apparently, a few players don’t love Susan. I won’t just heal, despite being a Conjurer. I also explore and attack the occasional pirate or diremite. Around an hour into one dungeon, I receive some vitriolic messages. It’s clear I haven’t played the role they wanted. To be fair, they are all dead. The party leaves me in the dungeon to fend for myself. Susan may not be a maverick. Calme doesn’t fare much better, despite his bulky frame and juiced-up axe. Several FATEs play out the same way, requiring teamwork over persistence. It’s a lesson I learn early and begrudgingly. For late-game play (and especially end-game play like the primal battles), lone wolf tactics fail. Guildleves (other group quests) also need the steady hands of at least a healer and a tank. Even with the right tactics, I’m still short on the chief currency for purchasing value from ARR: time. After a month, Susan and Calme retire, taking their secrets with them. I’ll probably never face Ifrit, or ride in Magitek armor, or see Eorzea to its second (and probably final) apocalypse, when the real ravages of time put the fiction and its characters to rest. The way there is barred by time, which keeps me out and the true ARR disciples in. Some 25 hours from when I started and I’m no wealthier for it. In fact, now I’m more aware of my dire poverty, which is somehow worse than the ignorance that came before it. 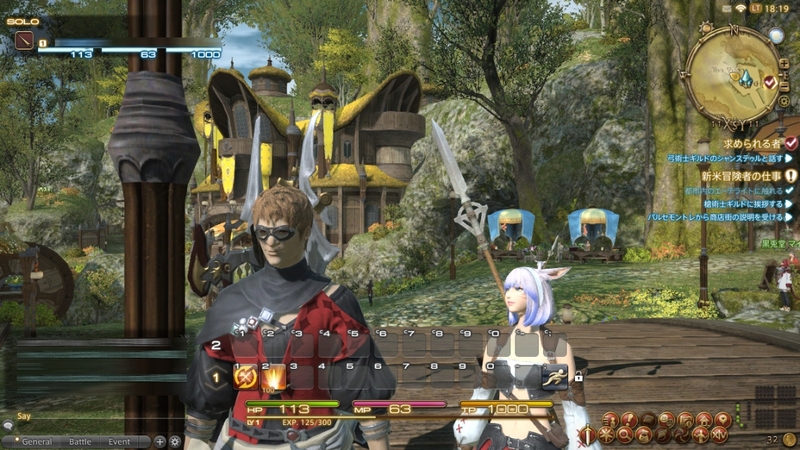 Final Fantasy XIV doesn’t offer much of a payout for 25 hours of play; more is required. I’m a novice conjurer and a weak marauder with several enemies on American servers and potentially the same amount in France, all because I lack the time commodity needed to trade for excellence in either job. But there’s a compulsive kind of draw to Eorzea, a world bubbling with checklists desperate to be checked. I can almost hear myself skipping through the text boxes now, eager to jump back into that dungeon, staffs blazing. I turn the profanity filter on. Dan Crabtree is an I.T. guy and freelance writer with words on Paste, Ars Technica, Kill Screen and Gamernode. His dog is considered handsome and well-read. You can find him (the human) on Twitter.